I haven’t done one of these contact sheets for a long time and I thought that this set was an interesting example. I submitted this set of sixteen pictures and they are all landscape in orientation. That’s because the slot they were shot for was across two pages and always a squarish landscape image. As I said in the previous post, the whole thing was done in ten minutes on a dull Autumn (fall) day in Hyde Park. That time included setting up and breaking down the Lumedyne light and chatting to the subject. Note that she is clutching her novel in the opening frame. I find that it’s always a good idea to do that if their publicist insists so that you can then go on to get the pictures that will actually get used. It’s an education to see such a wide range of poses and camera positions over one ‘sheet’. Which shot was used? Do you have one you prefer? The trouble is that your own taste changes over time. I like the middle frame in the second from bottom row these days but at the time I think that they got it right and went with the one directly above it. 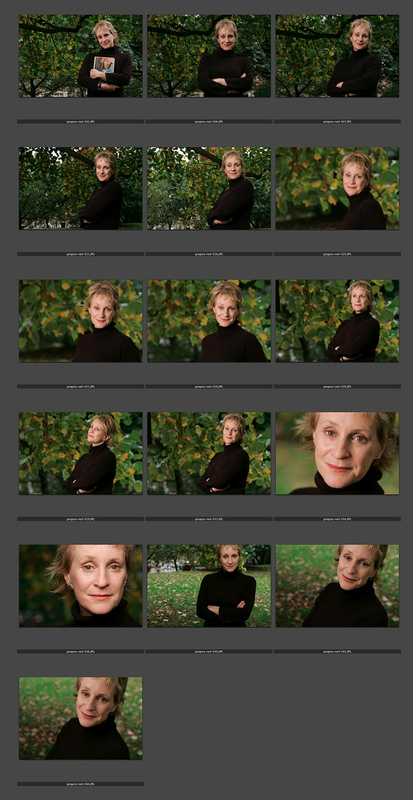 For me that’s a fairly basic selection of shots from a portrait. If you see some of the other contacts the variety will be greater 99% of the time. Do you think less experienced photographers would shoot a much narrower range of different poses? I think that good photographers learn very quickly how to shoot a range of options – especially press photographers who rarely know what the layout will be. The real rick is to still get the range of options when time is severely limited and the temptation is to go with the most likely option and nothing else. If you can get good shots whilst covering all of the bases within the time allowed you are a good photographer.